The first video from our apple road trip to North Carolina and Virginia is up on YouTube; click on http://www.youtube.com/watch?v=lSltvzCEdNA to see the first of three parts of my interview with C. Lee Calhoun, author of Old Southern Apples, discussing Lee’s efforts to locate, catalog, and bring back into cultivation apple varieties that were grown in the South over the last 200 years. 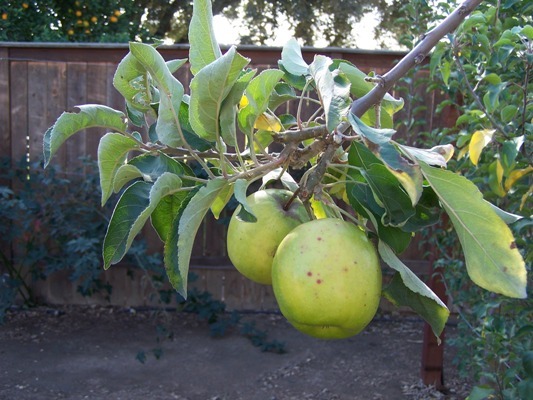 Lee and his wife Edith are treasures as are the apples they have tirelessly worked to save. Just so you don’t think I’ve been slacking the last few days, above is a photo from our apple road trip we’ve just returned from. We traveled to North Carolina and Virginia on the trail of Old Southern Apples, and started out with a visit with C. Lee Calhoun, author of the book by that very name. 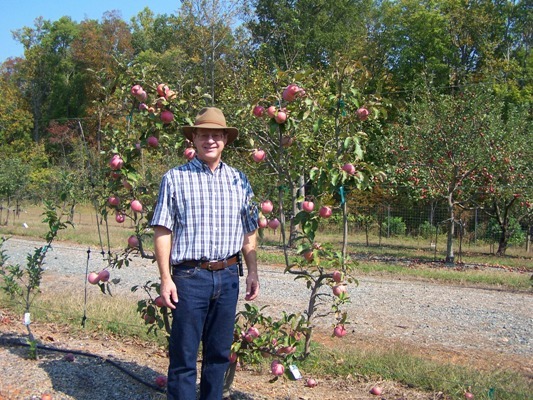 The next day we visited the heritage orchard at Horne Creek Farm in Pinnacle, NC, where Lee has planted an orchard with hundreds of the varieties he’s found in his trips across the South hunting down old varieties. The tree behind me is Terry Winter, and although larger and deeper in color, tasted identical to the ones we just finished harvesting here in Southern California. It was nice to be able to sample how these apples taste in their native home; I’ll be doing a few more posts on this trip in the coming days and even a couple of You Tube videos. This apple has been growing on us the last couple of years. 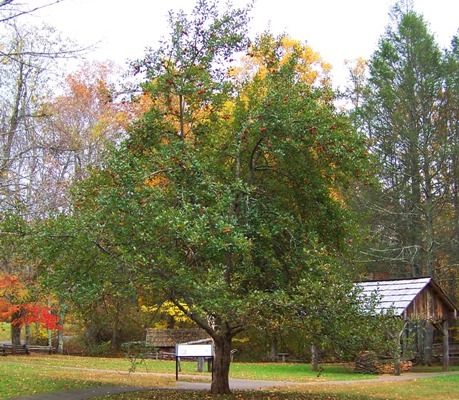 Originating in the town of Chili, New York in 1875, Stump apple ripens here the end of September and beginning of October. It insanely overbears and if you don’t thin it, you end up with a bunch of golf balls, which I always do as I don’t have time to thin. I’ll hand them out at work and folks are amused at this tiny little apple, until they bite into it; their eyebrows raise up and they are amazed at the spicy sweet apple flavor packed into this little fruit. It has a nice fruity aroma and is firm and crisp, our heat not bothering it at all. I wish I had enough for a pie or cider. It is very vigorous here and reliably bears big crops, and thus is a candidate for export to the tropics where they would be blown away by the flavor. It cracked badly the first couple of years, but since has grown out of that bad habit. 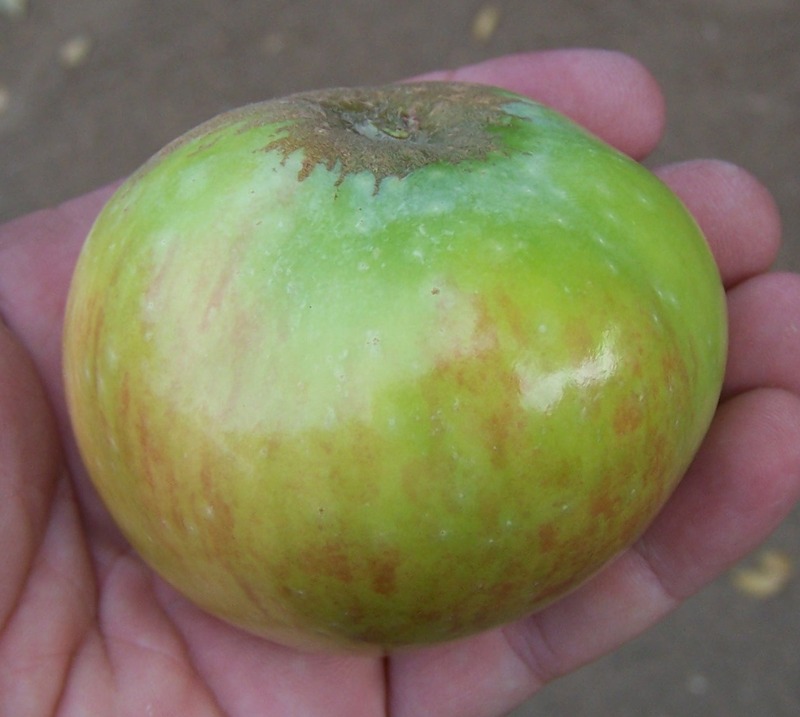 “Annie Elizabeth is an old-fashioned English cooking apple, possibly a seedling of Blenheim Orange, which it resembles in shape and size, and also in its relatively sweet flavour. ” The one shown above resembles the illustration provided with the description. It dates from about 1850 in England, and is said to be a good apple for baking where it needs to hold it’s shape. It is also said to do well in a cold, damp climate, and we found it held up to a stinking hot and dry climate just fine also. It riped in our worst heat but was still crunchy, juicy, and sweet-tart. I wish we had enough to bake a pie with; oh well, maybe next year. 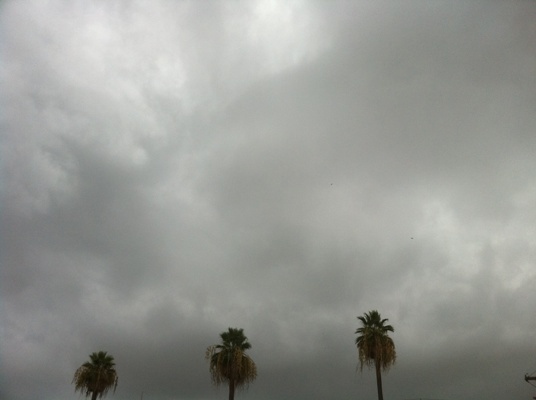 *Weather update: it actually rained today- not a thunderstorm or tropic monsoon, but an actual rain storm like we get in the winter, and was cold and windy. It is still supposed to be in the 90s by Saturday. One week ago it was 113 degrees here; today it struggled just to get into the 70’s, and the sun never peeked out all day. This Saturday is supposed to be 95 degrees again. Big Bear Lake in the mountains is getting down to 34 tonight. There’s a big battle going on between summer and fall here, and I hope fall wins soon (I agree with a co-worker that anything over 80 degrees is stupid and uncalled for). My friend Damo from Australia asked to see a photo of the entire Granny Smith tree, as his is “tippy with a lot of bare wood” (which means it bears only on the branch tips, and the branches also only have leaves on the tips). He said it bears heavily though. 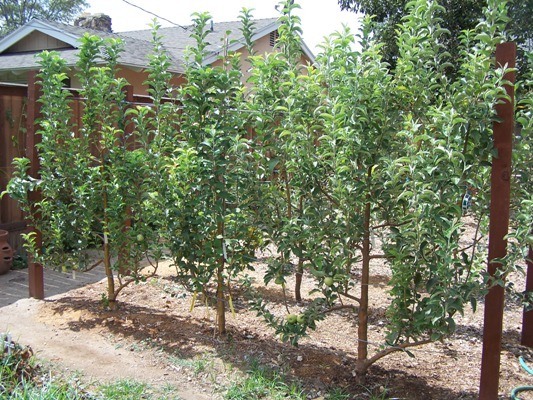 In this photo the Granny Smith tree is on the right, and the two left ones are Pink Lady. All three are on seedling rootstock, but its easy to keep them trimmed to this size by summer pruning (I suspect I have a bit of wooly aphid also, which can stunt the growth). You may see some tags on the bottom of the middle tree; this is my “Frankentree” that I graft scionwood on from our collecting tours. I really like using the seedling rootstock, as the tree bounces back from any borer attacks or irrigation failures. They pretty much outgrow anything that tries to damage them, and you don’t have to worry about pruning them wrong. Its like a bad haircut that will grow out and you can try again. I just bit into the best Granny Smith of my life. It had fallen to the ground after a thunderstorm today, with a codling moth hole in it, and so I expected mushy blandness (especially after Monday’s 113 degree heat). What I got instead was a crispy, very juicy, wonderfully sweet/tart zingy appley treat. Never had I tasted anything like this in the store, nothing even close. Granny Smith does wonderfully here, always producing large crops, seems to be self-fertile, and blooms a long time to pollinate other apples. If you thin them hard they can get huge. It seems to really enjoy long, hot summers and even direct sun doesn’t make it flinch. 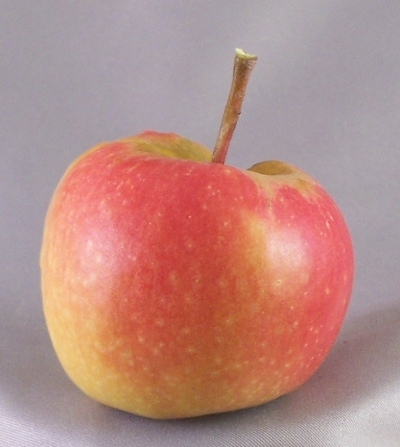 It truly is an heirloom apple, dating from 1875 in Australia, the oldest supermarket variety in existance. Funny it didn’t catch on in America until the 1980’s; I wonder what other old apples will ever make it to our supermarket after being in obscurity for a century.